The NBA season is still in jeopardy because of the lockout between the owners and the players, but that won’t stop Jordan Brand from releasing signature shoes of their NBA models. 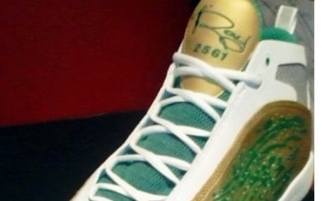 Like the one that is said to be coming this Holiday season, the Air Jordan 2011 “Ray Allen 3-Point Record” edition. We all know that Ray Allen became the all-time 3-point record holder last season after making his 2561st three-pointer, which will be the main theme of his new sneaker. The shoe features the famous green-gold-white colourway of the Boston Celtics plus the number 2561 on the tongue of the shoe! Watch out for this one and you will absolutely love it!